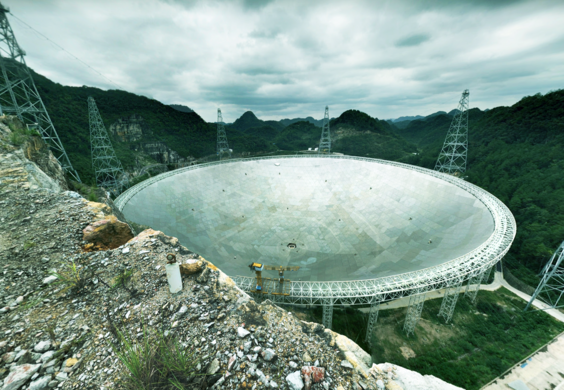 The largest radio telescope in the world searches for extraterrestrial life from the remote limestone peaks of southern China. 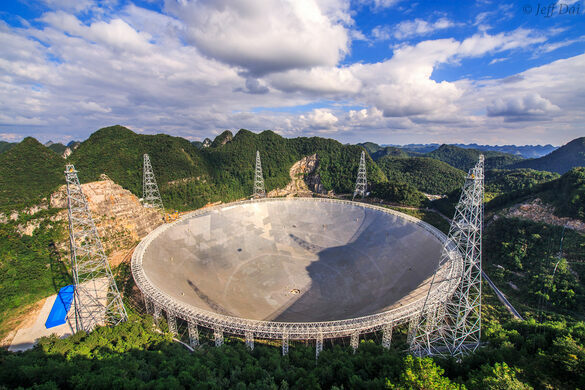 Nestled in a natural valley among the remote limestone peaks of southern China’s Guizhou Province, the Five Hundred Meter Aperture Spherical Telescope (FAST) receiver is the largest radio telescope in the world, dwarfing Russia’s RATAN-600 or Puerto Rico’s Arecibo Observatory. A golden temple atop a sacred mountain, known for its giant effigy of the revered Pu Xian. Made by river sediment, it is the largest alluvial fan in the world. Beijing's version of Disneyland, completely abandoned, mostly destroyed. 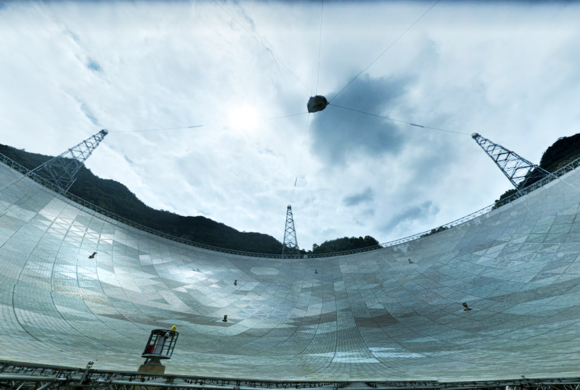 Also known by the more literary moniker “The Eye of Heaven,” this enormous dish was completed in 2016 to peer into distant celestial bodies billions of lightyears away. 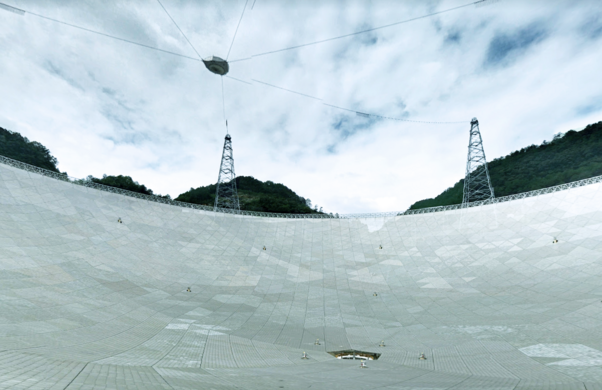 Its mission includes probing the remote parts of the universe to listen for signals of alien life, furthering our understanding of dark matter, and helping to map the Milky Way galaxy. The telescope’s sheer size defies photographic expectations: You could easily fit 30 football fields or a Ford Class aircraft carrier within its yawning circumference. 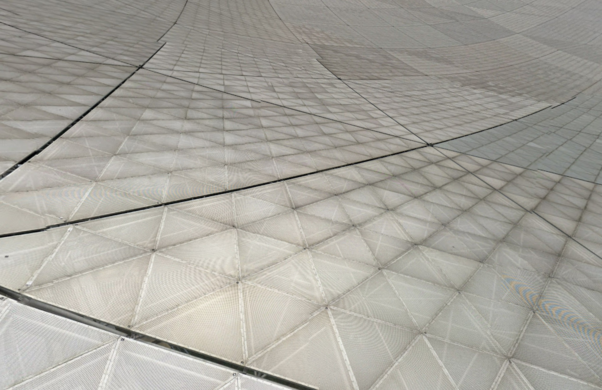 The seemingly solid disk is actually composed of 4,450 triangular aluminum panels mounted on hidden winches and cables that can deform to focus on different sky locations. The movable “eye” part of the telescope hangs overhead on cables like an NFL camera and can zoom around the dish, aiming at different dish angles like an iris darting across peripheral views through a contact lens. The remoteness has done little to deter the crowds of tourists who come to peer into the Eye of Heaven and snap selfies with its shiny disk. Dozens of new hotels, restaurants, and even a theme park have sprouted up to serve the demand, but they might end up producing the very light and RF pollution that could interfere with telescope observation. It took an artist 20 years to create this sprawling sculpture garden honoring the area's ancient inhabitants. The so-called "Richest Village In China" is either a model Communist town or a dystopian sham. On special occasions, one of the world's tallest artificial waterfalls gushes down the side of this Chinese skyscraper. This quiet area of Yunnan County annually transforms into an unbelievable sea of yellow flowers. A one-of-a-kind sundial at the Very Large Array honors a radio astronomy pioneer, incorporating the original piers from his breakthrough radio telescope. A delightful but little-known public observatory and planetarium in Munich.